« A Turkish-style solution for Egypt? The military shepherds transition to democracy? Hysteria is not a sign of health. 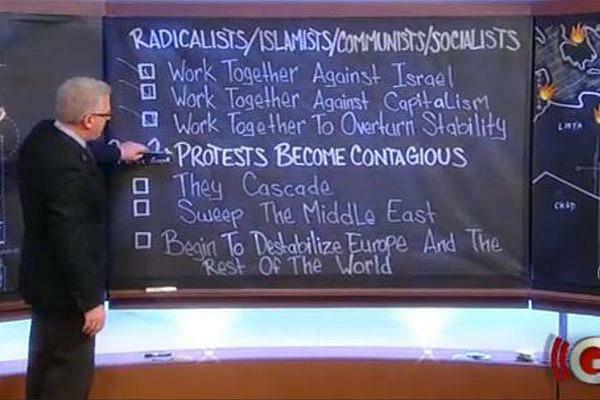 When Glenn Beck rants about the caliphate taking over the Middle East from Morocco to the Philippines, and lists (invents?) the connections between caliphate-promoters and the American left, he brings to mind no one so much as Robert Welch and the John Birch Society. He’s marginalizing himself, just as his predecessors did back in the early 1960s. To their great credit, National Review editor Rich Lowry and Fox News commentator Bill O’Reilly also rejected Beck’s hysteria. But where are the elected Republican officials who know better? They appear to be willing to let Beck’s theories spread through the electorate, trusting that it will produce anti-caliphate votes for the Republicans in 2012. This entry was posted on February 13, 2011 at 11:08 pm and is filed under Ethics-general, Government, International, Media, Politics, Religion. You can follow any responses to this entry through the RSS 2.0 feed. You can leave a response, or trackback from your own site. I don’t think it is Boehner’s job—at all—to confront the Birthers. For one thing, it doesn’t do any good. For another, I don’t think it is the responsibility of the Republicans to embrace that groups as their own. They are Republicans because they are Birthers; they aren’t Birthers because they are Republicans. I would welcome a condemnation if he or another GOP leader chose to do it, but I don’t see tacit approval if he doesn’t. As for the Muslim issue, 1) it shouldn’t make any difference and 2) if Bill Maher thinks Obama is really a Muslim, why is this a Republican responsibility either? I’ll do more on this on Ethics Alarms. Gregory was out of line. Hmmm, why would you welcome a condemnation? Could it be because you think it would be the right thing to do? Me too.